Washington: For nearly two years since Robert S. Mueller III was appointed special counsel to lead the Russia investigation, the country has scavenged for hints of how long the probe will last and how it will end. A clue appeared out of the blue Monday when acting Atty. Gen. Matthew Whitaker made the surprise disclosure that the case that has tormented President Trump is almost over. “The investigation is, I think, close to being completed, and I hope we can get the report from Director Mueller as soon as possible,” Whitaker said during an unrelated news conference announcing fraud charges against Chinese telecom company Huawei. Rumours have been churning in Washington that Mueller, who previously served as FBI director, might be nearly finished. But no Justice Department officials have stepped forward to publicly say so until now, and it’s unusual for them to make such statements about any investigation. I hope we can get the report from Director [Robert S.] Mueller as soon as possible. For an investigation in which the most frequent comment from prosecutors is “no comment,” Whitaker’s response was the equivalent of a neon billboard. The special counsel’s office has declined to answer almost any question from reporters and, in keeping with its standard practice, refused to comment when reporters sought a response to Whitaker’s statement. The comments from Whitaker, who also said he has been “fully briefed” on the Russia probe, will likely be viewed sceptically by Democrats concerned about his closeness to the White House and fearful that Mueller will face political pressure to wrap up his work. 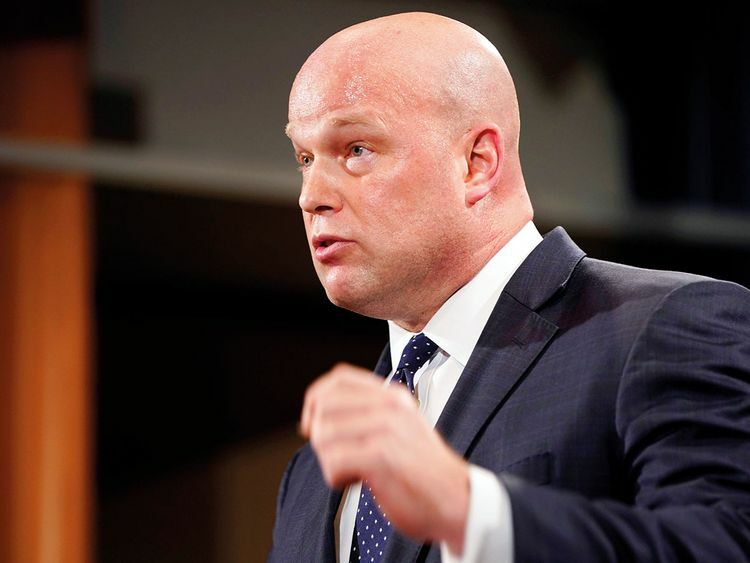 Whitaker often criticised the case in radio and television appearances as a conservative commentator before getting hired at the Justice Department as chief of staff to then-Atty. Gen. Jeff Sessions. When Trump forced out Sessions and replaced him with his former aide after the midterm election in November, Democrats feared that Whitaker could try to shut down the investigation and they urged him to recuse himself. Whitaker has refused despite the recommendation of a senior ethics attorney at the department. The claim that the investigation is nearly over comes just days after Roger Stone, a longtime adviser to Trump, was arrested and charged with lying about his conversations involving WikiLeaks and hacked Democratic Party emails during the 2016 presidential campaign. Stone is expected to plead not guilty at a court hearing in Washington on Tuesday. Stone is the 34th person charged in the investigation into Russia’s efforts to subvert the 2016 election and its possible coordination with Trump associates. Although no one has been accused of conspiring with Russians to interfere with the campaign, Mueller has exposed widespread lying and assorted criminality within Trump’s inner circle. The president’s former campaign chairman, deputy campaign chairman, national security adviser and personal lawyer have all been convicted or pleaded guilty. In addition, the special counsel’s office has outlined a dedicated effort by Moscow to boost Trump’s candidacy and undermine Hillary Clinton. A dozen Russian military intelligence officers have been charged with hacking emails that were later released through WikiLeaks, and an additional 13 Russians were accused of spreading misinformation on social media. Trump has nominated William Barr, who previously served as attorney general under President George H.W. Bush, as a permanent replacement for Sessions. He still must be confirmed by the Senate. Barr has promised not to interfere with Mueller’s investigation. “I would resign rather than follow an order to terminate the special counsel without good cause,” he wrote to senators. Among previous hints that the investigation could be winding down, Deputy Atty. Gen. Rod Rosenstein has told associates that he plans to step down from his job in the near future, something he was reluctant to do until the case was in its final stages. Rosenstein has been supervising Mueller’s work. But for the most part, the guessing game about the Russia investigation’s timeline has been filled with misses. Ty Cobb, the first White House lawyer tasked with dealing with Mueller’s office on behalf of Trump, said in August 2017 that he expected the probe to end in the coming months. “I’d be embarrassed if this is still haunting the White House by Thanksgiving and worse if it’s still haunting him by year-end,” Cobb told Reuters. When he left the White House in May 2018, the investigation was still in full swing. Rudolph W. Giuliani, a former New York City mayor who later joined the president’s legal team, has made predictions of his own but acknowledged he didn’t have a clear picture.